Background: Despite the scientific and medical advances for management of complicated health issues, the current maternity care setting has increased risks for healthy women and their babies. The aim of this study was to conduct an overview of published systematic reviews on the interventions used most commonly for management of normal labor and delivery in the first stage of labor. Materials and Methods: The online databases through March 2013, limited to systematic reviews of clinical trials were searched. An updated search was performed in April 2014. Two reviewers independently assessed data inclusion, extraction, and quality of methodology. Results: Twenty-three reviews (16 Cochrane, 7 non-Cochrane), relating to the most common care practices for management of normal labor and delivery in the first stage of labor, were included. Evidence does not support routine enemas, routine perineal shaving, continuous electronic fetal heart rate monitoring, routine early amniotomy, and restriction of fluids and food during labor. Evidence supports continuity of midwifery care and support, encouragement to non-supine position, and freedom in movement throughout labor. There is insufficient evidence to support routine administration of intravenous fluids and antispasmodics during labor. More evidence is needed regarding delayed admission until active labor and use of partograph. Conclusions: Evidence-based maternity care emphasizes on the practices that increase safety for mother and baby. If policymakers and healthcare providers wish to promote obstetric care quality successfully, it is important that they implement evidence-based clinical practices in routine midwifery care. Giving birth is a life-changing event, and the care that a woman receives during labour has the potential to affect her both physically and emotionally the short and longer term." The World Health Organization (WHO) states that the aim of intrapartum care is achieving a healthy mother and child using the least possible number of interventions consistent with safety. Despite the scientific and medical advances for management of complicated health issues, the current maternity care setting has increased risks for healthy women and their babies. There are worries all over the world that non-evidence-based interventions and practices during labor and delivery remain the standard practice. So, there remains a widespread underuse of beneficial practices, overuse of harmful or ineffective practices, and hesitancy about the effects of insufficiently, inadequately evaluated practices. Therefore, improving the quality of maternity care in both developed and developing countries is an important part of attempts made to decrease maternal and neonatal mortality and morbidity. One of the best approaches for quality improvement of care in clinical environments with limited resources is application of evidence-based standards for management of spontaneous vaginal births. , Evidence-based labor and delivery management apply the best available research on the safety and effectiveness of special practices to help decide on maternity care and achieve the best possible outcomes in mothers and newborns. It is essential that obstetricians and midwives who provide care during labor ensure that intrapartum care is evidence-based clinical practice  A large number of studies of maternity care interventions have been published. It is obvious that systematic reviews of individual studies were needed to evaluate, summarize, and bring together available studies in a single place. The objective of the overview of reviews is to summarize multiple intervention reviews for the identification of the effects of two or more interventions for a single situation in relation to health issues. In obstetric care, many interventions are complex, containing a number of different components which may have an effect on the impact of the interventions in healthcare settings. Several Cochrane and non-Cochrane systematic reviews have assessed different types of interventions for normal labor and delivery management. We intend to summarize their results for decision-makers, such as clinicians, policymakers, or informed consumers, in an overview of systematic reviews. This overview will serve as a user-friendly "digest" by evaluating and synthesizing current evidence which will allow the reader a quick overview of different interventions used most commonly for normal labor and delivery management. A literature search of online databases (PubMed, Web of Science, Google Scholar, and Cochrane Library) through March 2013 was performed. An updated search was performed in April 2014 in Cochrane Library. We translated the search strategy for each database plus each management aspect (e.g. early admission, early rupture of membranes) using the appropriate controlled vocabulary as applicable. The search was limited to systematic reviews of clinical trials. We also reviewed the reference lists of identified publications for additional pertinent reviews. No language restrictions were imposed. The titles and abstracts were obtained and the decision process for eligibility was followed. Full text was obtained of all eligible reviews and those whose eligibility could not be discerned from reading the abstract. Twenty-three systematic reviews of randomized or quasi-randomized controlled trials were considered for inclusion in this overview of systematic reviews on the management of normal labor and delivery in the first stage of labor. ,,,,,,,,,,,,,,,,,,,,,, The participants in these reviews were limited to low-risk, healthy women with an uncomplicated pregnancy, with a singleton gestation in vertex presentation, entering spontaneous labor, and having a gestational age of 37-41 weeks. We considered aspects of interventions used for management of normal labor and delivery in the first stage of labor. Each aspect of labor and delivery was reviewed separately. We have used systematic reviews that included interventions with placebo/no treatment or with a different intervention. We extracted data on systematic reviews (the first author's last name, year of publication, number of papers included in the review, methodological details, midwifery intervention, outcome measured, and results). For each review, the data were independently extracted by two investigators (MI and EZ), and if their evaluations differed, the discrepancy was resolved by discussion. It is important to consider the type of evidence included in reviews, i.e. was the review restricted to randomized trials only or other types of studies included, and also to assess how well the review was conducted methodologically. As such, a two-stage process was employed: Firstly, the level of evidence was graded and secondly, the methodological quality was assessed. All eligible reviews were assessed using a measurement tool for the assessment of multiple systematic reviews (AMSTAR). AMSTAR is an 11-item tool to assess the methodological quality of systematic reviews that has been internally and externally validated and has been found to have good reliability. The 11 items were assessed for each review and the total number of positive answers for each was documented. The reviews were then divided into the following categories: High quality: 9 or more positive answers; intermediate quality: 5-8 positive answers; and low quality: 4 or less positive answers. Two authors (MI and EZ) independently performed quality assessment. Disagreements were resolved by discussion or consultation with a third individual (MJ). Judgments about the quality of the primary studies were taken from the respective systematic reviews. We assessed the Cochrane reviews using the domain-based evaluation for assessment of risk of bias. For non-Cochrane systematic reviews, we have summarized the methods used to assess methodological quality, including details regarding the tools used and the dimensions assessed, e.g. sequence generation, allocation sequence concealment, blinding, incomplete outcome data, etc. We have presented characteristics of included reviews and AMSTAR ratings for each systematic review in summary tables. We have provided a narrative summary of the results of the individual reviews for all outcomes reported by the studies for each of the aspects of normal labor and delivery management. It was not anticipated that we would be able to perform any quantitative data analyses. [Figure 1] shows a flow diagram describing the study selection process. The initial search yielded 1190 research reports, of which 54 were excluded for having the same title or authors and 1136 were excluded due to not having eligible study design (including non-human studies, case reports, comment, letter, and observational study). Additional 36 studies were found irrelevant to the original research question and were excluded. Of the 90 remaining studies, 67 either updated by another included review, not systematic review, inappropriate population, inappropriate intervention, or not meet inclusion criteria. 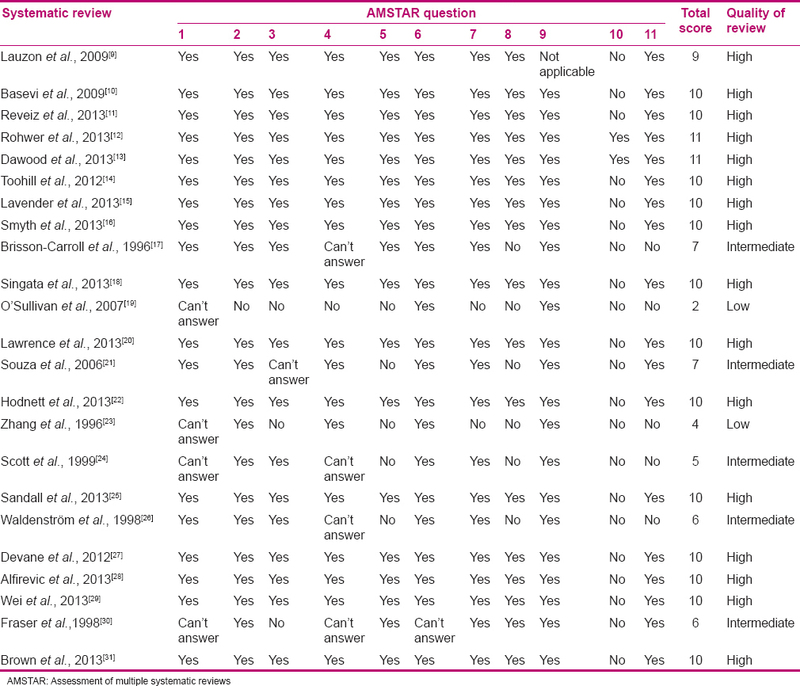 A total of 23 systematic reviews were included in our overview [Table 1]. All systematic reviews assessed interventions used most commonly for labor and delivery management in the first stage of labor. All reviews were published between 1996 and 2013, with the majority (n = 18) having been published from 2000 to 2013. Overall quality of the existing systematic reviews was variable. The quality of Cochrane reviews was high, but the quality of non-Cochrane reviews was intermediate or low [Table 2]. To avoid losing meaning, the findings contain direct quotes as those authors of systematic reviews have stated. There were two systematic reviews related to use of routine amniotomy during labor. In the Smyth et al. review,  a total of 5583 women were recruited in 15 trials comparing amniotomy with intention to preserve the membranes. All data in the review were presented by the allocated group (intention-to-treat analysis) and not by the intervention actually received. On the basis of the findings of this review, we do not recommend that "amniotomy be introduced routinely as part of standard labor management and care." The meta-analysis by Brisson-Carroll et al. implied that "routine amniotomy is associated with both benefits and risks. Benefits include a reduction in labor duration and a possible reduction in abnormal 5-minute Apgar scores. The evidence provides no support for the hypothesis that routine early amniotomy reduces the risk of Caesarean delivery. An association between early amniotomy and Caesarean delivery for fetal distress was noted in one large trial, suggesting that amniotomy should be reserved for patients with abnormal labor progress." There were two systematic reviews related to the restriction of fluids and food in labor. Singata et al. identified five studies (3130 women). In this Cochrane review, the overall quality of the evidence was reasonable. The authors concluded that "since the evidence shows no benefits or harms, there is no justification for the restriction of fluids and food in labor for women at low risk of complications." The meta-analysis by O'Sullivan et al. (5 studies, 973 women) suggested that current evidence does not support the concept that caloric data shortens the duration of labor. Authors of this review implied that "current studies do not support the claim that oral intake decreases the Cesarean section (CS) rate." We found two systematic reviews of maternal position and mobility during labor. Lawrence et al. included 25 studies with a total of 5218 women. Overall, the quality of the studies included in the review was mixed and most studies provided little information on the methods. Authors of this Cochrane review concluded that "walking and upright positions in the first stage of labour reduces the duration of labour, the risk of caesarean birth, the need for epidural, and does not seem to be associated with increased intervention or negative effects on mothers' and babies' well being. Women should be encouraged to take up whatever position they find most comfortable in the first stage of labor." Two systematic reviews were related to continuity of midwifery care during labor. A Cochrane review of 13 studies (16,242 women) determined that "most women should be offered midwife-led models of care and women should be encouraged to ask for this option although caution should be exercised in applying this advice to women with substantial medical or obstetric complications." The methodological quality of the included trials based on allocation concealment was "high quality" for nine trials and "unclear" for two trials. Waldenström et al.,  in another review, reported, "Continuity of midwifery care is associated with lower intervention rates than standard maternity care. No statistically significant differences were observed in maternal and infant outcomes. However, more research is necessary to make definite conclusions about safety, for the infant as well as for the mother. This review illustrates the variation in the different models of alternative and standard maternity care, and thus the problems associated with pooling data from different trials." Two systematic reviews were related to cardiotocography (CTG) during labor. Devane et al. found no evidence of benefit for the use of admission CTG for low-risk women on admission in labor. The findings of current evidence support recommendations that "the admission CTG should not be used for women who are at low risk on admission in labor. Women should be informed that admission CTG is likely associated with an increase in the incidence of CS without evidence of benefit." Alfirevic et al. implied that "continuous CTG during labor is associated with a reduction in neonatal seizures, but no significant differences in cerebral palsy, infant mortality or other standard measures of neonatal well-being. However, continuous CTG was associated with an increase in CSs and instrumental vaginal births. The real challenge is how best to convey this uncertainty to women to enable them to make an informed choice without compromising the normality of labor." Brown et al. compared low-risk women receiving a predefined package of care (active management) with women receiving routine care. In this review, the quality of the included studies was variable. Authors of this review reported, "Active management is associated with small reductions in the CS rate, but it is highly prescriptive and interventional. It is possible that some components of the active management package are more effective than others. Further work is required to determine the acceptability of active management to women in labor." Our main objective was to find, summarize, and bring together existing systematic reviews in a single place as the authors of these papers have reported. 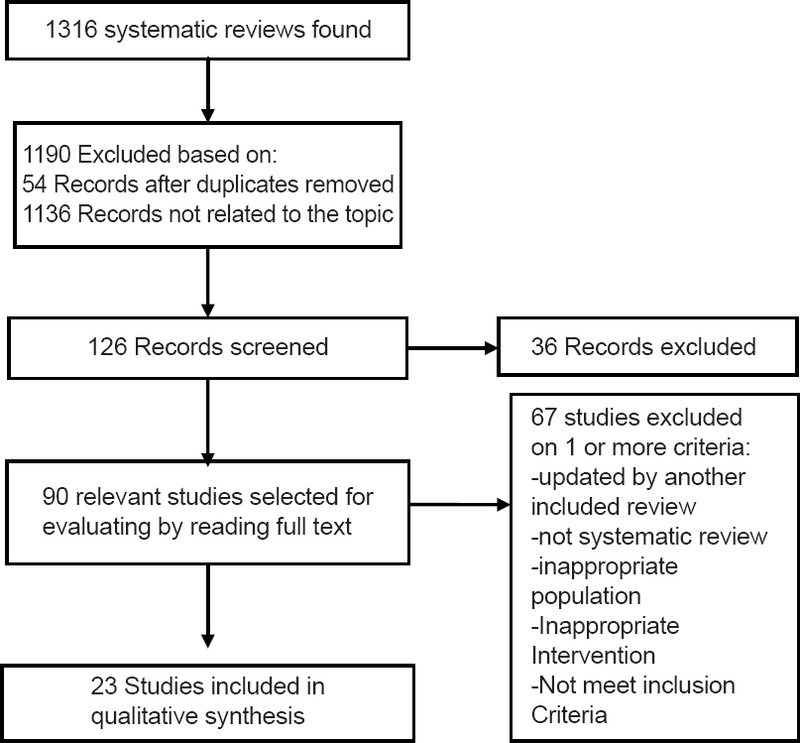 Due to the breadth of the topic, it was not possible, in this review, to describe comprehensively all intrapartum interventions that have been subjected to systematic review, but this review of systematic reviews was aimed at identifying high-quality reviews on the interventions used most commonly for management of normal labor and delivery in the first stage of labor. This overview included 23 systematic reviews including 16 Cochrane reviews and 7 non-Cochrane reviews. It was not surprising that all Cochrane reviews received high-quality grading. For the non-Cochrane reviews, scores were intermediate or low; this was commonly because some features of the review process may not have been clearly stated in the published reviews. Our study showed that the Cochrane reviews had a greater level of appraisal for the quality of the included studies. Although all reviews are summarized and reported, we focused our conclusion on reviews of higher quality (AMSTAR > 5). Based on this overview, scientific evidence does not support routine enemas, routine perineal shaving, continuous electronic fetal heart rate monitoring, routine early amniotomy, and restriction of fluids and food in labor; these practices can be associated with complications without sufficient benefits, and should probably be avoided. Evidence supports of continuous support, continuity of midwifery care, encouragement of non-supine position, and freedom in movement throughout labor; these practices should be routinely performed. There is insufficient evidence to routine administration of intravenous fluids and antispasmodics during labor; therefore, it should probably be left for women to decide. More evidence is needed regarding delayed admission until active labor and use of partograph. There are several strengths of this overview. First, it applied a comprehensive search strategy. Second, duplicate screening, data extraction, and quality assessments were conducted. Third, a validated instrument (AMSTAR) was used to evaluate the methodological quality of included reviews. Finally, the conclusions reported in this review highlight the usefulness of bringing together a summary of reviews in one place for assistance of evidence-based clinical decision-making. These conclusions are important for maternity care practices and should be implemented throughout the clinical centers. Our overview has several limitations. First, the aim of this overview was to evaluate the systematic reviews instead of the individual initial studies, which means there is a risk of rarifying the results of high-quality studies by including low-quality data. The second limitation of this review is the variation in practices. Third, it is possible that some of the newly published studies have not yet been included in the reviews and, therefore, are not included in our review. Some of the routine interventions that are common during labor and birth might not always be essential or beneficial for women with uncomplicated and low-risk pregnancies. It is important that an evidence-based approach to intrapartum care be incorporated into clinical practice setting. This overview of systematic reviews detected high-quality evidence to support effective practices for normal labor and delivery management in the first stage of labor. The review also has identified the interventions which are supported by limited evidence as areas for future research. This study as part of PhD thesis of the first author was approved by Isfahan University of Medical Sciences, Iran (with code of 391206). Hereby, the researchers appreciate the Faculty of Nursing and Midwifery of Isfahan University of Medical Sciences for approving the study. National Collaborating Centre for Women′s and Children′s Health (UK). Intrapartum Care: Care of healthy women and their babies during childbirth. London: RCOG Press; 2007. (NICE Clinical Guidelines, No. 55). Sandin-Bojo AK, Kvist LJ. Care in labor: A Swedish survey using the Bologna Score. Birth 2008;35:321-8. Lothian JA. Safe, healthy birth: What every pregnant woman needs to know. J Perinat Educ 2009;18:48-54. Khresheh R, Homer C, Barclay L. A comparison of labour and birth outcomes in Jordan with WHO guidelines: A descriptive study using a new birth record. Midwifery 2009;25:e11-8. Sakala C, Corry MP. Evidence -Based Maternity Care: What it is and what it can achieve. Childbirth Connection. New York : Milbank Memorial Fund; 2008. Available from: http://www.childbirthconnection.org [Last accessed on 2013 March 20]. Freedman L, Graham WJ, Brazier E, Smith JM, Ensor T, Fauveau V, et al. Practical lessons from global safe motherhood initiatives: Practical lessons from global safe motherhood. Lancet 2007;370:1381-91. Girot EA, Enders BC, Wright J. Transforming the obstetric nursing workforce in NE Brazil through international collaboration. JAdv Nurs 2005;50:651-60. Misago C, Kendall C, Freitas P, Haneda K, Silveira D, Onuki D, et al. From ′culture of dehumanization of childbirth′ to ′childbirth as a transformative experience′: Changes in five municipalities in north-east Brazil. Int J Gynaecol Obstet 2001;75(Suppl 1):S67-72. Gülmezoglu AM. Promoting standards for quality of maternal health care. Br Med Bull 2003;67:73-83. Smith V, Devane D, Begley CM, Clarke M. Methodology in conducting a systematic review of systematic reviews of healthcare interventions. BMC Med Res Methodol 2011;11:5. Becker LA, Oxman AD. Overviews of reviews (Part 3: Special topics. Chapter 22). In: Higgins JP, Green S, editor. Cochrane handbook for systematic reviews of interventions. Version 5.1.0 [Last updated on 2011 Mar 12]. Dowding DW, Cheyne HL, Hundley V. Complex interventions in midwifery care: Reflections on the design and evaluation of an algorithm for the diagnosis of labour. Midwifery 2011;27:654-9. Moher D, Liberati A, Tetzlaff J, Altman DG; PRISMA Group. Preferred reporting items for systematic reviews and meta-analyses: The PRISMA statement. Ann Intern Med 2009;151:264-9. Lauzon L, Hodnett E. Labour assessment programs to delay admission to labour wards. Cochrane Database Syst Rev 2009;(1):CD000936. Basevi V, Lavender T. Routine perineal shaving on admission in labour. Cochrane Database Syst Rev 2009;(2):CD001236. Reveiz L, Gaitán HG, Cuervo LG. Enemas during labour. Cochrane Database Syst Rev 2013;(7):CD000330. Rohwer AC, Khondowe O, Young T. Antispasmodics for labour. Cochrane Database Syst Rev 2013;(6):CD009243. Dawood F, Dowswell T, Quenby S. Intravenous fluids for reducing the duration of labour in low risk nulliparous women. Cochrane Database Syst Rev 2013;(6):CD007715. Toohill J, Soong B, Flenady V. Interventions for ketosis during labour. Cochrane Database Syst Rev 2012;(2):CD004230. Lavender T, Hart A, Smyth RM. Effect of partogram use on outcomes for women in spontaneous labour at term. Cochrane Database Syst Rev 2013;(7):CD005461. Smyth RM, Alldred SK, Markham C. Amniotomy for shortening spontaneous labour. Cochrane Database Syst Rev 2013;(6):CD006167. Brisson-Carroll G, Fraser W, Bré art G, Krauss I, Thornton J. The effect of routine early amniotomy on spontaneous labor: A meta-analysis. Obstet Gynecol 1996;87:891-6. Singata M, Tranmer J, Gyte GM. Restricting oral fluid and food intake during labour. Cochrane Database Syst Rev 2013;(8):CD003930. O′Sullivan G, Liu B, Shennan AH. Oral intake during labor. Int Anesthesiol Clin 2007;45:133-47. Lawrence A, Lewis L, Hofmeyr GJ, Dowswell T, Styles C. Maternal positions and mobility during first stage labour. Cochrane Database Syst Rev 2013;(10):CD003934. Souza JP, Miquelutti MA, Cecatti JG, Makuch MY. Maternal position during the first stage of labor: A systematic review. Reprod Health 2006;3:10. Hodnett ED, Gates S, Hofmeyr GJ, Sakala C. Continuous support for women during childbirth. Cochrane Database Syst Rev 2013;(7):CD003766. Zhang J, Bernasko JW, Leybovich E, Fahs M, Hatch MC. Continuous labor support from labor attendant for primiparous women: A meta-analysis. Obstet Gynecol 1996;88:739-44. Scott KD, Berkowitz G, Klaus M. A comparison of intermittent and continuous support during labor: A meta-analysis. Am J Obstet Gynecol 1999;180:1054-9. Sandall J, Soltani H, Gates S, Shennan A, Devane D. Midwife-led versus other models of care for childbearing women. Cochrane Database Syst Rev 2013;(12):CD004667. Waldenström U, Turnbull D. A systematic review comparing continuity of midwifery care with standard maternity services. Br J Obstet Gynaecol 1998;105:1160-70. Devane D, Lalor JG, Daly S, McGuire W, Smith V. Cardiotocography versus intermittent auscultation of fetal heart on admission to labour ward for assessment of fetal wellbeing. Cochrane Database Syst Rev 2012;(2):CD005122. Alfirevic Z, Devane D, Gyte GML. Continuous cardiotocography (CTG) as a form of electronic fetal monitoring (EFM) for fetal assessment during labour. Cochrane Database of Syst Rev 2013;(5):CD006066. Wei S, Wo BL, Qi HP, Xu H, Luo ZC, Roy C, et al. Early amniotomy and early oxytocin for prevention of, or therapy for, delay in first stage spontaneous labour compared with routine care. Cochrane Database Syst Rev 2013;(8):CD006794. Fraser W, Vendittelli F, Krauss I, Bré art G. Effects of early augmentation of labour with amniotomy and oxytocin in nulliparous women: A meta-analysis. Br J Obstet Gynaecol 1998;105:189-94. Brown HC, Paranjothy S, Dowswell T, Thomas J. Package of care for active management in labour for reducing caesarean section rates in low-risk women. Cochrane Database Syst Rev 2013;(9):CD004907. Shea BJ, Grimshaw JM, Wells GA, Boers M, Andersson N, Hamel C, et al. Development of AMSTAR: A measurement tool to assess the methodological quality of systematic reviews. BMC Med Res Methodol 2007;7:10. Higgins JP, Green S, editors. Cochrane handbook for systematic reviews of interventions version 5.1.0 [Last updated on 2011 Mar]. The Cochrane Collaboration, 2011. Available from: http://www.cochrane-handbook.org. [Last accessed on 2013 March 15 ]. Simkin P. The birth partner: A complete guide to childbirth for dads, doulas, and all other labor companions. 3 rd ed. Boston: Harvard Common Press; 2007. Fraser W, Turcot L, Krauss I, Brisson-Carrol G. Amniotomy for shortening spontaneous labour. Cochrane Database Syst Rev 1999;4:CD000015.F. World Health Organization. Department of Reproductive Health and Research. Care in normal birth: A practical guide. Geneva, Switzerland: World Health Organization; 1999. Chalmers B, Kaczorowski J, Levitt C, Dzakpasu S, O′Brien B, Lee L, et al. For the Maternity Experiences Study Group of the Canadian Perinatal Surveillance System; Public Health Agency of Canada. Use of routine interventions in vaginal labor and birth: Findings from the Maternity Experiences Survey. Birth 2009;36:13-25. Enkin M, Keirse M, Neilson J, Crowther C, Duley L, Hodnett E, et al. A guide to effective care in pregnancy and childbirth. New York: Oxford University Press; 2000.